Joyce Glasser reviews The Workshop (L’atelier) (November 16, 2018), Cert. 15, 114 min. The unbeatable team of director Laurent Cantet and scriptwriter Robin Campillo continues, after a brief separation (in all but Campillo’s editing services), in The Workshop , a genre-busting drama about a creative writing workshop that spills out of the classroom exploring social tensions in a small port city. A racially mixed group of recent high school graduates at loose ends in their lives have enrolled in a local government-sponsored workshop led by published author Olivia Dejazet (Marina Foïs). 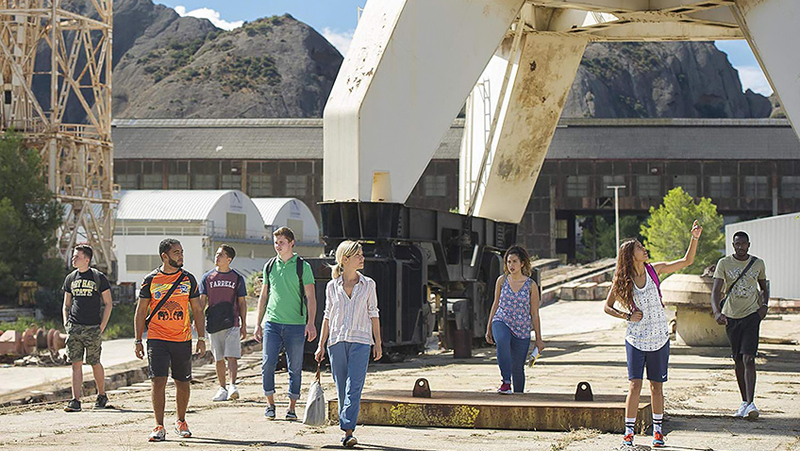 One aim is for the group to publish a collective book reflecting La Ciotat’s industrial heritage and the other is to for the students to learn to work as a team. While the students elect to embark on a murder mystery, the relationship between one pugnacious student and Olivia becomes tainted with its own sinister tension. Campillo’s signature trait – his uncanny ear for the way young people interact in a group – and Cantet’s ability to capture the complex dynamics of the student/teacher relationship go beyond their Academy Award nominated film, The Class with something more complex and equally topical. Like François Ozon’s In the House, which merged reality and fiction in his tale of a writing teacher in thrall to his precocious student, Cantet and Campillo must be aware of the parallels between their collaboration on a script about a group collaborating on a novel. The film begins with a videogame of a fantasy warrior brandishing his sword on a mountain top and then shooting a cross-bow into the sky, a gesture that will be mirrored toward the end of the film when the video game player, Antoine (Matthieu Lucci), symbolically marks a turning point in his search for his place in the world. This opening establishes Antoine as the principal character, whose fixation with the Mediterranean Sea– that affords escape – is only matched by his obsession with his physical image. This might relate to his interest in army recruitment videos or an insecurity about his sexual identity as he prepares to leave home. Our knowledge of Antoine builds with his comment to the workshop that the marina at La Ciotat, rather than the historic dockyards, should be the setting because ‘yacht-owners make good victims.’ But it is a piece he writes and reads out loud for the first group assignment about a mass shooting continues to alarm and intrigue Olivia. Its content stuns even his peers who are exposed to cartoon violence, Instagram and contemporary films and the news. A Muslim student, Fadi (Issam Talbi) protests that ‘it’s disgusting’ to which Antoine replies, ‘it’s not more disgusting than the Bataclan’, referring to the massacre of innocents at Paris’ Bataclan Theatre in 2015. Olivia, and a student protesting with a statistic that 40% of those radicalised are white Frenchmen prevent a fight from breaking out. But Olivia, already alarmed at Antoine’ will pay Antoine a home visit to discuss his provocative behaviour. Olivia is not a trained teacher, but a novelist and, as in The Class, the challenging students are pitted against a flawed teacher struggling to contain students who continually test the limits of her authority. These kids might not know a lot about creative writing, but they are older than their years. When, in the context of outlining the murder/thriller they are planning a student mentions a Kalashnikov rifle, he is quickly told off that that is a war weapon and the murder weapon would probably be a 7.62 calibre gun. As all but one student, loner Antoine (Matthieu Lucci) hurry to the bus stop after the first class, they evaluate Olivia, focuses on the social distance between them and their ‘arrogant’ and ‘pretentious’ imported mentor. ‘I hate her Parisian accent,’ one throws in while another gripes that ‘they rented her a fancy villa’. Though Cantet’s films are thankfully devoid of sentimentality, we notice that these harsh opinions diminish over time as the students realise they have, each in his or her own way, benefitted from the course. As the teenagers (all of whom are first time actors) mull over the rules of creating a plot, describing a setting and identifying a point of view for the murder mystery, their individual backgrounds and personalities come into focus, revealing the teenagers to be politically aware and self-assertive. One student is just there because of the job centre forced him to sign up and he rationalises that it is better than mixing-cement; another wants the story to reflect contemporary life rather than the city’s industrial past. Malika (Warda Rammach), a serious, third-generation Algerian teenager whose grandfather worked in the docks, proposes that her grandfather could provide them with historic background in their research. Relieved and delighted at Malika’s proposal, Olivia quickly points out that research is important, even in a novel. This is anything but a throwaway line as Antoine has already begun his research by watching a TV interview with Olivia on YouTube, spying on her in her apartment and reading her latest novel, which he admits to his little sister is, ‘not bad.’ But in class, it’s Antoine’s turn to be critic and he insults a violent scene as remote and superficial. While Olivia is shocked by Antoine’s candor and perhaps shaken by the truth in his comments, his aggressive tone is so alarming that she asks him to leave. Olivia’s curiosity about Antoine leads her to do her own research with catastrophic results. Her internet research leads to the discovery of Antoine’s participation in his cousin’s armed right-wing group nocturnal exercises. But Olivia’s frequent encounters with Antoine as he dives from the cliffs and exercises on the rocks create a sexual tension that he picks up on. It is here that you will recognise a rising star in Lucci, as he confronts Olivia openly, reversing the traditional teacher/student balance by declaring that she is afraid of him. Olivia had earlier confessed to her publisher that she hasn’t got the character right for her next novel, and needs time to rethink him. Whether it is to get inside the mind of her new character or whether it is an excuse to expose Antoine’s worrying right-wing leanings, Olivia invites Antoine to her apartment for an interview. Antoine is flattered, intrigued and puzzled in equal measure by this invitation and the tension is palpable. Olivia’s interest in Antoine is obviously exposing her to charges of child molestation, and it is a problem with the film that she seems so oblivious to this charge, which would ruin her career. That the filmmakers avoid this path might be a relief, but it also stretches credibility that Olivia can be so naïve.